This is a remix of the original e-NABLE Phoenix hand by Jason Bryant with replacement components by John Diamond, Scott Darrow and Andreas Bastian. For most individuals, everyday tasks such as picking up a water bottle, carrying a bag or using a computer can often be taken for granted. 3D printing is providing access to cheap prosthetics, but not to the tools used to design the 3D models. One limiting area within this pathway to prosthetics is the users reliance on others to design the parts. Those with the computer tools to create complicated parts required for prosthetics are not always the ones who are specialist in the prosthetic industry. I believe many of the true specialist, those with hand limb-loss, are blocked out of contributing to a field that is extremely important to them. Computers or more specifically the computer mouse has become a roadblock for the real specialist from creating hand prosthetics. Democratising prosthesis design is one way to minimise the current lack of access patients have to prosthetics care. Meaning, you are the one most intouch with your own experience and having the ability to help yourself was what I wanted to give the user. Before I could really begin to do this a deeper understanding of many things was needed. The key aim during the understand stage was to seek the answers to three questions. What does the successful use of a mouse mean? What are the limitations to existing products on the market? What do users want in regards to computer control with a prosthetic? From my experience I defined what was necessary and what was convenient for the successful use of a mouse. I examined the mouse functions by counting the number of clicks whilst using a range of different programs. There were many variations of what can be defined as successful mouse use. The main function were moving and clicking, but they became more complicated depending on the type of programs that were used on the computer. Mouse control was separated into three categories, Basic, Standard and Advanced. Advanced which involved left and right clicking, holding and dragging. Used on programs similar to CAD and also gaming. To test readily available 3D printed prosthetic technology, I borrowed a 3D printed Phoenix V2 hand. The hand was assembled by James Novak that he downloaded from Enabling the future website. I used the Phoenix V2 as a tool to elicit empathy for the users. From this testing, I began analysing the key feature of a mouse that was inaccessible whilst using the prosthetic hand. Framing the problem areas into levels of mouse control and limiting factor of the user informed my efforts to understand it's limitations and move towards ideating, iterating and building sketch models with a framework in place. Understanding this product category also required research into more existing devices on the market. Valuable insights from the research converged my area of focus. Such as level of technology that would still allow my device to be affordable and what users wanted out of a prosthetic hand. Whether it may be physical or emotional needs. 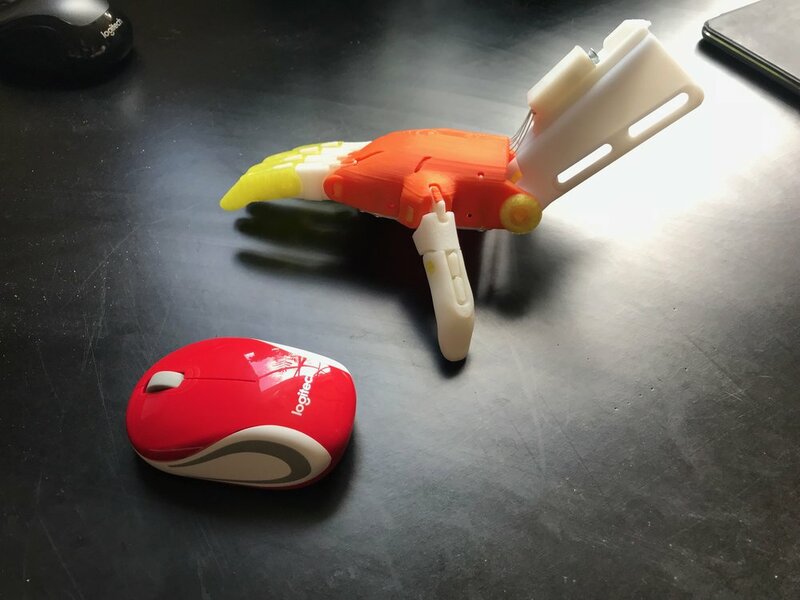 Analysing the Phoenix hand and testing its limitations when used with a mouse.